Westlake Legal Group > Posts tagged "Maryland News"
WASHINGTON — In just one week, Maryland lawmakers will be back at work in Annapolis to begin a 90-day session. Leaders say they hope to tackle a range of topics in this year’s session, including banning so-called “ghost guns,” criminal justice reform, legalizing marijuana and extending harassment laws to more employees. But the first order of business when the session begins Jan. 9 will be swearing in the 141 delegates and 47 senators. There are 43 new House members and 17 new state senators this year. Delegate Kathleen Dumais, who was first elected in 2002 and has been appointed House Majority leader, said she looks forward to mentoring newcomers. “It’s an awesome undertaking to become a member of the Maryland House of Delegates, and whatever I can do to help our new members, I’m happy to do,” she said. Seventy-one women won seats in the Maryland General Assembly, and many are newcomers to the State House. Dumais, who serves on the House Judiciary Committee, said getting the perspectives of the growing number of women in Annapolis is a welcome and important development. “I’ve certainly seen it in the type of legislation that I’ve worked on over the 16 years I’ve been a member of the house — on family law, domestic violence and sexual assault legislation,” Dumais said. While the Kirwan Commission continues to work on overhauling education policy and coming up with a formula to fund it, Dumais said lawmakers will continue to explore issues brought up in the commission’s report, including the expansion of early childhood education. Dumais said lawmakers will look at banning so-called “ghost guns” as well as 3D-generated firearms. Proponents of the bans say that 3D-generated guns present a problem, because they can’t be detected using the type of scanners found at courthouses and airports. It’s illegal to remove serial numbers from firearms, but federal law permits a person to buy the parts needed to assemble a firearm without any identifying marks, such as a serial number. Delegate David Moon said he’ll be looking at legislation that would keep nonviolent offenders from being sentenced to serve jail time. He said he’s especially interested in looking at how and why people with mental illness often end up in the criminal justice system, instead of getting needed care. “That is not a cheap problem to address, but I think increasingly it’s one that ordinary folks on both sides of the aisle realize is a big problem,” Moon said. Moon said he will also work on legislation to make cannabis legal in the state. Possession of marijuana — less than 10 grams — has been decriminalized, but it is not legal unless it is medical marijuana. Moon said he sees a potential for revenues from the cannabis industry to fund education, mental health and substance abuse services. Maryland’s Coalition Against Sexual Assault had a number of legislative victories in 2018. Executive Director and Counsel for the organization Lisae Jordan, said the “Me Too” movement has kept a spotlight on workers that don’t get protections under the current Maryland laws against harassment and discrimination. Companies with fewer than 15 employees are not subject to a number labor laws that deal with harassment, Jordan said. Jordan also wants to change the law that said if an employee faces sexual harassment, they have 300 days in which to report it. “We need to change those things,” she said, noting that in cases of sexual harassment, victims may delay reporting for a number of reasons, including fear of losing work. “We need to give women and men a longer time to report,” she said. Lawmakers will be in Annapolis until the final day of the session, “Sine Die,” on April 8. Police say the medical examiner determined last month that Anderson died as a result of the 2007 shooting. Police say his death is reflected in 2018’s homicide count. That brings the year’s total to 309, a nearly 10 percent drop from 342 in 2017. BALTIMORE (AP) — Police say a 14-year-old was hurt by celebratory gunfire early on New Year’s Day near Baltimore’s Inner Harbor. Police said in a statement that officers responding to a report of a shooting at 12:12 a.m. Tuesday found a 14-year-old boy with a graze wound to the head and he was taken to a hospital. A celebration with a midnight fireworks display is held at the Inner Harbor. Det. Chakia Fennoy says investigators believe the boy was struck by celebratory gunfire since it doesn’t appear that he was targeted. Meanwhile about 2 miles (3.22 kilometers) away, police say officers happened upon a man shooting into the air near his home. Police say officers arrested 44-year-old Gary Watts, seized three loaded firearms, including a semi-automatic rifle, and charged him with firearms violations. WASHINGTON — New Year’s Day falls on a Tuesday, so government-run locations and transportation systems may not be open, or may be working on a different schedule. D.C. Department of Public Works will not enforce meter and residential parking limits. The District Department of Transportation does not require meter fees be paid on New Year’s Day. Metrorail will run between 8 a.m. and 11 p.m. on a Sunday schedule. Bus service will also operate on a Sunday schedule. Off-peak fares are in effect, and parking is free for the at all Metro facilities. There is no VRE service. ART buses 41, 42, 43, 45, 51, 55 and 87 will run on Sunday schedules. All other lines will not run. Select Fairfax Connector routes will operate on a Sunday schedule. See the full list of operating routes here. D.C., Maryland and Virginia departments of motor vehicles are closed. D.C.: Trash pickup scheduled for Tuesday will happen on Wednesday. Trash and recycling collections will “slide” to the next day for the remainder of both weeks. This applies to both once-a-week and twice-a-week collection neighborhoods. Virginia: Arlington County trash collection is delayed by one day. Fairfax County trash collection is on a regular schedule. Maryland: To find out when your trash will be picked up in Montgomery County, click here for a chart. To find out when your trash will be picked up in Prince George’s County, click here. In Anne Arundel County, Monday collection that normally occurs on Tuesday will instead take place Wednesday. In Howard County, trash pickup will occur one day later than normally scheduled. All area schools are closed. Except for the National Gallery of Art, the Smithsonian museums are open — and barring an unlikely eleventh hour deal, Jan. 1 will be the last chance to see them before they shutter due to the ongoing government shutdown. Most banks are closed. Contact your bank branch for more details. WASHINGTON — More than 50 Maryland state lawmakers signed a letter urging the Maryland Board of Public Works to reject a deal that would let TransCanada build a pipeline in Western Maryland. Columbia Gas, owned by TransCanada, hopes to build a 3-mile long distribution line near Hancock, Maryland to allow natural gas to be carried from Pennsylvania to West Virginia. TransCanada has said the construction is needed to allow economic growth in West Virginia. Opponents, including environmental groups and dozens of Maryland state lawmakers including Delegate David Moon, D-Montgomery County, worry the pipeline could threaten waterways and wetlands in the proposed right of way. A proposal for an easement to allow the project to move ahead goes before the Maryland Board of Public Works on Wednesday. The board — made up of Gov. Larry Hogan, State Treasurer Nancy Kopp and Comptroller Peter Franchot — decides all state capital appropriations, preserves and protects all submerged lands and wetlands and handles state contracts. Those who signed the letter argue that since Maryland banned fracking in 2017, it doesn’t make sense to allow a pipeline to run through the state. The pipeline would run underneath the Potomac River and cross part of the Western Maryland Rail Trail. “I think a lot of us feel enough is enough, and it’s time to stop enabling fossil fuel consumption,” Moon said. Moon said the waterways and wetlands in the Hancock area of Washington County are “delicate” and deserve protection. Despite assurances that protections will be in place, there are concerns about the potential of damage in case of a leak. “I think that’s been one of the big fears whenever one of these big projects are proposed,” Moon said. In March, Maryland issued a permit for the pipeline that state officials said includes a number of conditions aimed at protecting the environment. At the time, Secretary of the Department of the Environment for Maryland Ben Grumbles said the pipeline could not be built if it didn’t comply with requirements set by the state. State officials say some of the safeguards required include protection of drinking water. “In addition to violating the spirit of our renewable energy portfolio and fracking ban, the TransCanada pipeline also directly endangers public health,” reads the letter addressed to the public works board. WASHINGTON — In one of his final tasks of 2018, President Donald Trump signed into law the Ashanti Alert Act, creating a nationwide alert system for missing, endangered adults between the ages of 18 and 64. The law is named for Ashanti Billie, of Prince George’s County, Maryland, who disappeared from the Hampton Roads, Virginia, area in September 2017. Her body was found two weeks later in North Carolina. At 19 years old, Billie was too old for an Amber Alert, the child abduction alert system, and too young for a Silver Alert, the system to help locate seniors who are missing. Sen. Mark Warner, D-Va., a principal sponsor of the Ashanti Alert Act, said the young woman fell through the cracks of the system. To bridge the gap, the federal Ashanti Alert system will empower police to notify radio and TV stations, and activate road and highway electronic signboards for critically missing adults. WASHINGTON — Police in Montgomery county arrested a pair of suspects on Monday afternoon after receiving a report of an armed carjacking near Wheaton Mall. It happened on the 11100 block of Veirs Mill Road. The victim told police the suspects showed her a gun and took her car at about 3:30 pm. She provided a description of the suspects and her car, and 15 minutes later, police spotted the car in Fairland, Maryland, about eight miles away. The suspects were stopped without incident, and police found a replica handgun in their possession. Police are working on the case and the suspects will be identified after charges are filed. Below is the area where the car was stolen and where it was recovered. 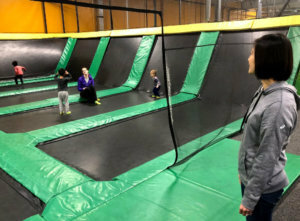 WASHINGTON — On a day when he would normally be at day care, 5-year-old Jai Cai launched himself into the air on a trampoline as his mom looked on. The stop in Gaithersburg, Maryland, was one of many activities his mother, June Cai, had planned for him as she took unexpected time off from her job at the Nuclear Regulatory Commission. June Cai’s agency is fully funded, so she is expected to be at work, and her paychecks are still coming in during the partial government shutdown. But, her son attends a day care at the National Institute of Standards and Technology in Gaithersburg, which has run out of money. “All of a sudden, we found ourselves without day care basically, very unexpectedly,” Cai said. The day care struggle is something Cai and federal employees deemed essential have encountered since the shutdown began. Cai doesn’t have any other relatives in the area, and since her son has special needs, it hasn’t been as simple as finding space in another day care for the duration of the shutdown. “There are some in-home day cares, but we really can’t drop him off on such short notice with the special needs he has,” Cai said. She said the solution she and her husband, who works in the private sector, were forced to come up with is alternating days off between the two of them. For both, that means using up vacation days that they won’t get back when the day care reopens. “We are each looking at using a week or two of vacation,” she said. Cai added that they are also looking into babysitters who can spend a few hours with their son so they can work from home. Making things more difficult for the family is what is in the fine print in their contract with the day care. “We have to pay for the first five days of a shutdown, so even though we don’t have day care, we’re actually paying for the first five days of it as well,” Cai said. For the family, the hope now is that a budget deal will be made soon, not only for their sake, but for their son’s sake, since not going to school has been a disappointment for him. “How do you explain it to a 5-year-old, why his school is closed, why we don’t know when it’s going to be open, why he can’t see his teachers, why he can’t see his friends?” Cai said. 3 arrested after man found fatally shot in car in Prince George’s Co.
WASHINGTON — Prince George’s County police have arrested three suspects in connection with a deadly shooting Saturday morning in Beltsville, Maryland. Around 11:45 a.m., police said officers were called to the 11300 block of Evans Trail for a welfare check. There, they found 38-year-old David Ruen, of Laurel, in a car with a gunshot wound. He was pronounced dead on the scene. Police said the deadly shooting likely followed a robbery during an illegal drug deal. Three people have been arrested for their suspected involvement: Kawanta Adams, 44, of Beltsville; Tarik Revel, 43, of Beltsville; and Clinton Revel, 43, of North Carolina, face multiple charges, including first-degree murder and robbery. Adams and Tarik Revel are already in the custody of the Prince George’s County Department of Corrections; Clinton Revel is in custody in North Carolina pending extradition to the county, police said. Police also announced other arrests made in connection to separate shootings before the start of the new year. Around 11:35 a.m. Friday, 31-year-old Eric Smith Jr., of Seat Pleasant, was found with gunshot wounds outside a home in the 200 block of 68th Place and later died. Police said they believe he was likely shot as part of an ongoing dispute between him and suspect Larence Godfrey Jr., 36, of D.C.
Godfrey and the second suspect, 41-year-old Michelle Godfrey, fled after the shooting but were later located in Delaware. They are awaiting extradition to Prince George’s County, police said. They face first- and second-degree murder charges. Then, around 10:40 p.m. Saturday, there was a shooting in Fort Washington, in which 66-year-old Adam MacAdam II was found fatally shot outside of his home. Police said they have arrested William Little, 42, of Fort Washington, in connection with the shooting, but are still investigating the motive. Little has been charged with first-degree murder, police said.